I was curious if this theory were broadly true, applicable for growth stage companies Brad mentioned, but also early stage companies. So, I calculated this metric, which I’ll call the GP metric in this post, for all the publicly traded SaaS companies over their lifetimes. The chart above plots the median GP metric by years since founding. I’ve added a horizontal line at 40%. The GP metric trends from 100%+ to about 30% over about 15 years. As Brad wrote, growth investors apply the 40% rule to companies with $50M+ in revenue, which is right around year five or six of most of these businesses, to quickly figure out if the high level financial profile might be a fit for them. And the median figures in years six and later seem to support the case that the rule of 40% might be a good filter for investors in later stage companies to identify outliers because the median decreases as these businesses mature, and a 40% floor would surface more attractive companies. 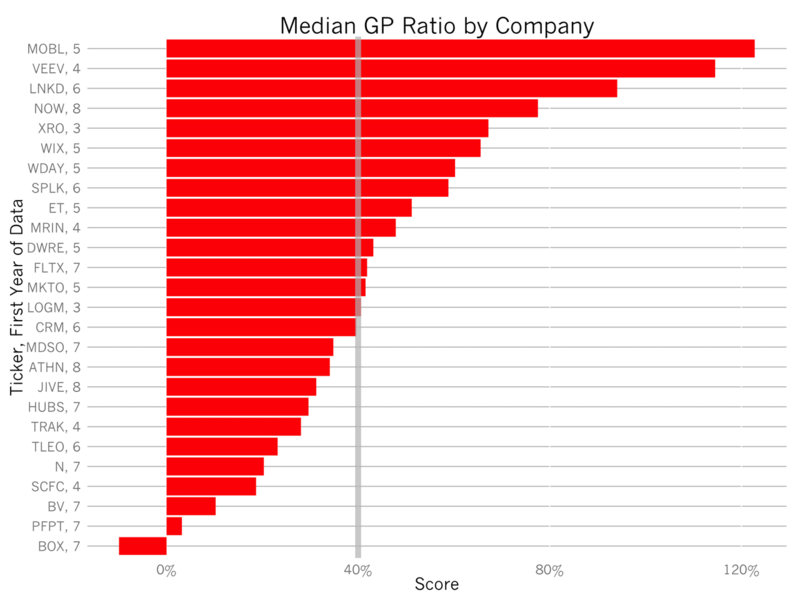 In the early days of a company’s life, though, the median GP metric is substantially greater, often exceeding 100%. In fact, it ought to be as high as possible. Larger values imply the business is growing quickly and/or generating lots of profit. For example, Workday charted the biggest GP figure in this data set of 189% in 2010 when the business grew from revenue by 252% and recorded net income of -57%. 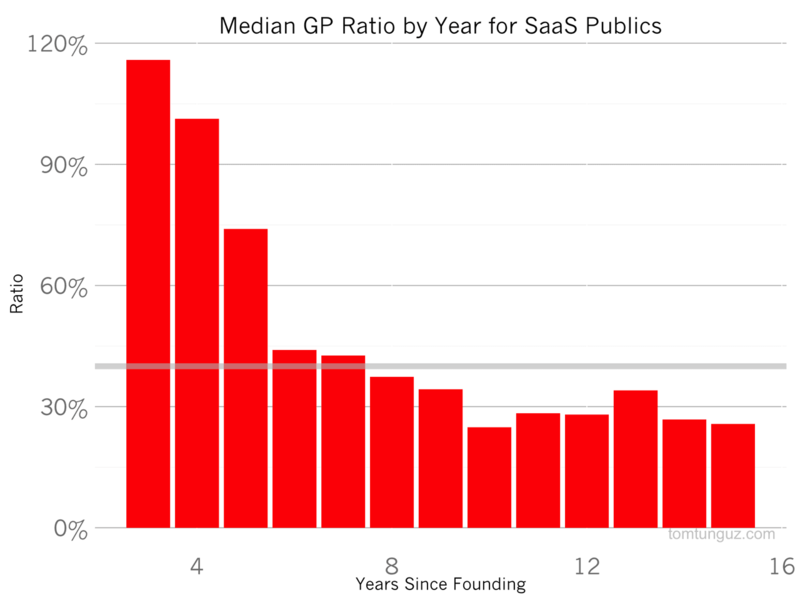 As they age, many public SaaS companies haven’t been able to sustain a 40% GP metric. 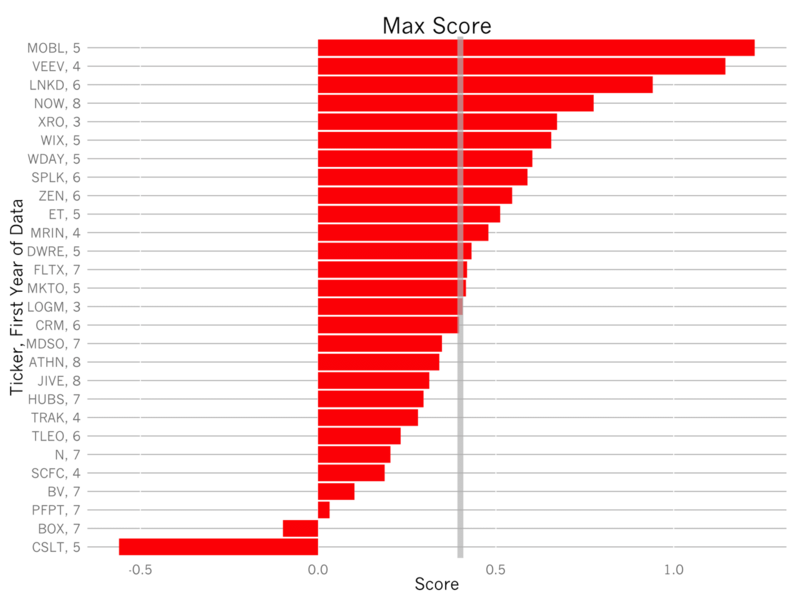 This chart shows the median score for each company across the number of years which they have provided data to public market investors. All of these companies are worth several hundred million to many billions of dollars. As Brad pointed out, the spirit of the Rule of 40% is a good one. The Rule establishes a relationship between the growth rate and burn rate of a business and defines a healthy operating zone for a growth stage business. Consequently, the Rule of 40% metric may be a solid first pass filter for a growth equity investor to determine whether a business might be a good investment candidate. But for early stage companies, whose GP metric may exceed 100% or more, founders should focus more on the unit economics (average revenue per customer, cost of customer acquisition, churn rates, contribution margin), which drive the business’s top line and bottom line. Everything else will take care of itself.